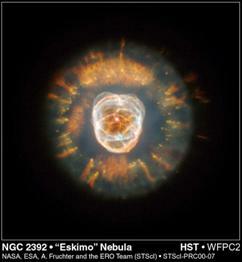 Summary: beautiful filament-systems are often shown by the astonishing development of the modern astronomy. Most of these filaments have an exact circular cross section. Filaments have the same interesting characteristics from a diameter of 0.01 mm to that of many 1000 of light-years. Filaments are incorrectly seen to be of plasma, however, particles move in only one direction in them, often against gravity. In this non-thermal (fifth-) state of matter, particles have up to 1016 -times higher energy than those in the hottest stellar plasma. The corona-problem and hundreds of other problems of astrophysics are solved at once. Only six states of matter are possible, all are briefly described. Key words: Acceleration of particles, Bose-Einstein condensate, corona, corona problem, cosmic rays, fifth state of matter, filament, flux tube, forbidden lines, heat-motion, hypernova, jet, lightning, magnetic tube, non-thermal-phenomena, pinch-effect, plasma, solar dynamo, state of matter, supernova, temperature-scale. Ice is transformed to water at 0°C when the energy of its molecules (particles) increases. Water is similarly transformed to vapor at 100°C (Fig.1). Much stronger zigzag motion of the particles separates and ionizes hydrogen and oxygen i.e. plasma comes into existence (above 13 000 K). Do all bodies fit one of these four states of matter? The answer is: no, e.g. the solar corona does not! Fig. 1 The temperature scale. It starts at 0K. Is it infinite long or does it have a highest end? The solar corona-problem is about 60 years old. The temperature of the corona of 2MK is much higher than that of the Sun i.e. the corona does not obey the thermodynamic law that heat does not flow uphill (Lang). Moreover, the solar corona - which floats visibly during the solar eclipse as a pale green fire - does not fall onto the solar surface. Thousands of other solar filaments seem not to obey gravity, too. Also, since decades, nobody can understand that millions of sun masses can be ejected with almost light-velocity via jets against the extremely strong gravity of a black hole. This paper calls to mind that all these celestial bodies which do not seem to obey thermodynamics, gravity and many other physical laws - have a filament form. Now, this paper shows that they are not in the fourth but in a fifth state of matter. No complicated, forced, ad hoc models like magnetic tubes, magnetic beds, magnetic tornados, shock waves, interactions of two stellar winds, photon pressure, frozen-in magnetic fields are necessary but simply a new state of matter for all filaments and jets. Filaments and jets in the fourth state of matter contradict physics many hundred times but they clearly obey all laws of physics in the fifth state of matter. Spark, lightning, ion beam, mercury-filament (in mercury-lamps) and electron beam in TV have a characteristic cylinder-form with exact circular cross section, a well defined matter and a measurable particle-energy, however nobody asks in which state of matter they are? In mercury lamps, mercury ions fly from the fluid state into the filament and back into the fluid state. 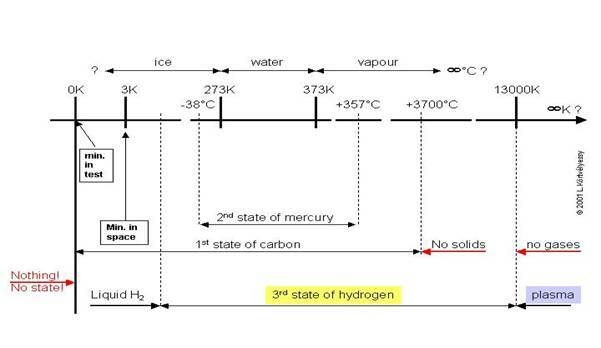 Are these mercury ions of the filament in no state of matter? Also the very similar - only larger - celestial filaments are often believed to be of plasma. It will be shown: terrestrial and celestial filaments do not consist of plasma. They are very similar because they are in the same fifth state of matter. Chandra discovered a World of wild Giants : jets are up to 7 million light-years long and of nearly light-velocity (3C236). The mass of the filament of the Centaurus galaxy-cluster is about 109 sun masses. Solid, liquid, gas and plasma bodies can be found in the temperature scale, where are these filaments, perhaps above 10 MK (in Coma cluster)? The answer is surprising for all scientists who naively believe in a non-electric Universe, because most of the celestial bodies cannot be found in the temperature scale. They are non-thermal bodies, they are in the fifth state of matter. where k is the Boltzmann constant: 1.38 × 10-23 J/K. Some examples: Electrons in the TV-beam have a particle-energy E of 26 000 electronvolt due to their accelerator-voltage of 26 000 V. The solar surface has about 1 eV or 6000 K, the solar core 2000 eV or 15 million K. Note, that electrons in the TV have 13 times higher energy than those in the solar core! Electrons of a lightning of 108 eV have even a thousand times higher energy than electrons in supernovae of 105 eV or 109 K. The lightning would have a temperature of 1012 K if it would be a plasma-body. It would emit a power more than that of 1011 suns from its body of only about 2 m³ (equ.1)! This impossible power-density also shows that this 1012 K is as impossible as – 1K ! The upper limit of the cosmic ray particles is at 1021 eV. We must discover the broad 16 orders between 105 eV and 1021 eV. All bodies which obey the Stephan-Boltzmann law (equ.1) cannot exist in this range. We shall see, this is the exclusive range of filaments. One 1021 eV-particle could elevate 1 kg into the altitude of 1.6 m but a particle of the hottest star only into 1.6 x10-13 mm. How are these cosmic ray particles accelerated? It is clear via equ.1 that a „super-hypernova should have the fusion-power of 1084 suns in order to have these particles of 1021 eV on its „plasma-surface (instead of the existing 1 eV)! „Lots of unsolved problems...are connected with particle acceleration (Trimble). The highest possible temperatures are by many orders too low to accelerate these particles of the cosmic rays. A correct model must also show why are these particles just atom-cores without electrons and not neutral atoms? We must take 9450 W just 30 0004 times according to the T4 law (equ.1). The result is: 1022 W and not 26 W! About 40 000 TV-beams of a small city would radiate more power than the whole Sun if the TV-beam was of plasma! A plasma filament of a mercury lamp would melt a house in microseconds. These impossible results prove that the TV-beam (or an ion-beam) is no plasma body! It does not obey the heat radiation law (equ.1). This result can be simply understood because the beam-electrons fly parallel to the beam-axis along straight lines with constant velocity. The zigzag-motion of plasma does not exist in this beam. Such particles do not emit heat, independently of their very high particle-energy. But the zigzag motion in the electrongas around the hot cathode (of some 10-2 eV i.e.1000 K) is smoothened by the voltage of +26000 V to a parallel flight in only one direction in the TV-tube. This elevation of the particle energy by 6 orders transfers the electrons from a thermal state of matter into a non-thermal state of matter. This filament gets a thermal state of matter again in the TV screen. A filament is a parallel flight of either electrons (Fig.2) or ions (Fig.3). Fig. 2 Terrestrial filaments (Stormguy). Divided into 28 parts, the big lightning keeps all branches in circular cross section. It would be invisible in all wavelengths in vacuum because its electrons do not attract (Fig.3) but repulse electrons. Fig. 3 Cold light of celestial filaments. TRACE shows bright foot-points and active (positive) area on the right and coronal hole (black negative area) on the left, where the positive filaments land. The TV-beams, the ion-beams, sparks from electrified combs and clothes, X-ray tubes, lightning (Table 1 and Fig.2) in our everyday life do not emit heat. Solid, liquid, gaseous and plasma bodies do have the heat-motion, but these filaments do not. Above these four „thermal states of matter, we can recognize a fifth, a „non-thermal state of matter (Also below these thermal states, a non-thermal state of matter exists, the Bose-Einstein condensate, see Table 3). The circular cross section can be observed on the TV-screen and in all filaments of a diameter of 0.01 mm (in CERN Table 1) up to many 1000 light-year (in jets of radio galaxies). Coronal filaments have the same width on the solar disc and on the limbs (Fig.3) i.e. these ion-filaments also have an exact circular cross section. Gravity produces spheres i.e. bodies of minimal volume (e.g. the Sun). All sections are circular. The electric force – the other force of infinite radius – produces cylinders i.e. bodies of minimal (circular) cross section. Spheres keep this rule along 4 orders of diameters but filaments along 20 orders! The electrically neutral jet of an aero plane has no filament-state, therefore, it cannot keep its circular cross section. If all filaments would be neutral, their explanation would need the production of trillions of mysterious magnetic tubes in lengths and in diameters of 20 orders! But we cannot find magnetic tubes already for the 8 very different kinds of solar filaments (Table 2). did not find magnetic tubes in the solar body – neither thin nor thick ones. But all charged filaments have the same elegantly simple explanation: the pinch-effect which automatically produces the cylindrical form of electrically charged and ejected matter. In CERN or in Fermilab, the ion-beam is only 20 mm long but it consists of ions of max. 1011 eV i.e. million times higher energy than the ions in supernovae. An electron furnace can transfer 150 kW with its electrons; its thin and invisible filament of a huge power does not emit heat, only the circular spot on the target. It heats very concentrated. X-ray tubes and Van de Graaff generators have electrons of 105 eV and 106 eV. These filaments have by orders different diameters, lengths, powers but exactly the same cylinder-form and the same motion of particles in only one direction and with only one velocity. All these filaments can oscillate like crystals and are fully organized also in their smallest parts (Fig.2) like crystals. A filament filled with hot plasma would expand in all directions like an H-bomb! 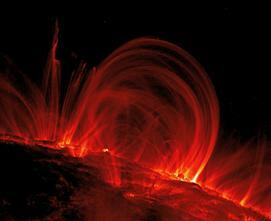 The hot coronal plasma would emit more heat than 1 million suns (equ.1). Its thought magnetic tube should hold it together, but magnetic tubes would magnetically explode also without the huge plasma-pressure in inside (Science@NASA in 2001 Nov 7). The empty magnetic tubes are thought to be closed, how can they be filled with hot plasma? The plasma-corona needs a force to move its matter in the filament but this force cannot be the Lorenz-force which is zero parallel to the alleged force lines of the magnetic tube . Forbidden spectral lines suggest that the corona has incredible low density. Its ions fly along thousands of kilometers without collision. This density is not lower in higher altitudes! These magnetic tubes would be strongly deformed via their transport from the dynamo to the surface through the boiling solar layers (Schrijwer and Title). Coronal ions of e.g. Fe9+ are present at the start, remain in the filament and will not be Fe13+ along the flight (Fig.3). Therefore, the corona is obviously not heated by e.g. microflares. If the corona would be very hot, it would radiate all of its energy into the Sun and empty space in milliseconds because it has no production of energy in itself. The alleged high temperature of the corona can be measured in two ways: Fe13+ ions suggest 1.8 MK but the broadening of their spectral lines suggests more than 7 MK! is the correct state of matter. Simply, the corona is not in the fourth but in the fifth state of matter. So, the corona obeys all laws of physics. The electrically emitted coronal ions fly along straight lines, they do not emit any electromagnetic waves from their very high motion energy, no X-ray, no UV - similar to the electron beam in the TV. 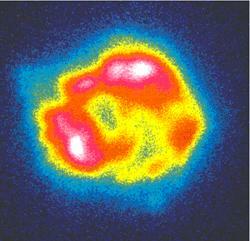 But they emit X-ray and UV (Fig.3) from their high electric energy via cold recombination of ions. These ions are present already at the start of the filament and are the cause of ejection. Ions are not made during the flight by thermal motion which does not exist! Also Fig. 3 shows no new ions. The corona is not hot and not cold. Its ions fly parallel to each other without collision along thousands of kilometers (Fig.3). The ions produce the filament and the filament does not produce the ions! Positive matter in these filaments flights to a negative (UV-dark) area. The ejection of a filament is always possible in the case of the Sun or even at the black hole because the electrostatic repulsion is 1036 times stronger than gravity between two protons. The attractive gravity has a relatively very weak effect compared to the repulsing electric force. No thousands of different magnetic beds are necessary! The solar filaments are electrostatic geysers directed by an electrostatic field. A filament can even oscillate as a bell and a trombone! A larger diameter increases the pinch effect, the smaller diameter increases the mutual electrostatic repulsion among the ions in a diameter-oscillation. This oscillation and that along the lengths broadens the spectral lines which suggest a coronal temperature above 7 MK in the same filament which should be only 1.8 MK due to its Fe13+ ions. Naturally both temperature-measurements have no sense because in the fifth state of matter no heat motion and no temperature exist. The fifth state of matter explains also the fact that a solar eruption makes the cylinder of the oscillating ions longer and longer. Analogy is a continually elongated trombone. One of the radio-emissions similarly shows a continually falling frequency. Galileo saw the penumbra of the sunspots. 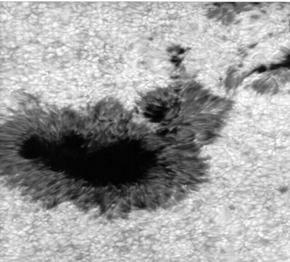 Larger telescopes show no gray ring but 100-200 fine dark filaments around the sunspots (Fig.4). Herschel named small, structure-less and round spots „planetary nebulae, the Hubble Space Telescope resolves about 40 fine filaments in the Eskimo planetary-nebula (Fig. 5). Filaments (legs ) of the M1-nebula gave later the name Crab to it. Skylab detected puzzling layers of the solar corona. SOHO and TRACE show no layers but hundreds of very fine filaments which culminate mostly higher if their atoms are stronger ionized (Fig. 3). ROSAT showed the supernova remnant Cassiopeia A as a hot, round, X-ray emitting plasma body (Fig.6), however, Chandra reveals its about 180 fine filaments (Fig.7) which explain the missing thermal radiation and almost gravity-free expansion via the fifth state of matter (Fig.10). Its positive charge explains that the Crab-nebula expands by 8% accelerated (Nugent)! The jets of the Vela- (Fig.8) and Crab- (Fig.9) pulsars were shown as coaxial to the rotational axis. Very strong gravity of the pulsar cannot retard these electrically ejected particles, moreover, the pulsars seem to be pushed by the stronger jet with a velocity of 100 km/s and 150 km/s respectively. Radio telescopes show (up to 7 million light-years long) one or two jets of radio galaxies and the ejected millions of sun masses. Solar filaments differ only in material and concentration of their ions. All solar filaments contain positive ions, only the filaments of the stellar wind are negative. The circular cross section of the solar wind is visible in the filament- curtain of auroras. These polar filaments, those of the corona (Fig.3) and penumbra (Fig.4) fly often parallel to each other in equal distances. The positive filaments attract each other as parallel currents and repulse each other as positive ions. The energy of all these filaments surely is no mysterious solar dynamo! The dynamo was not found by SOHO. They all have a filament-form, their particles fly parallel to the filament axis. They mostly have particles of higher energy than those of the plasma bodies. In spite of the very high particle-energy, they all do not emit heat. They all have a circular cross section and, therefore, a more or less bent cylindrical body. Like crystals, they have a deeply organized form, also in their smallest branches (Fig.2). Like crystals, they can oscillate with more frequencies. They move as if gravity would not exist even in the very mouth of a black hole. Their electric charge is either positive or negative. They dissolve in space at zero charge. Lightning, mass ejections are perhaps in no state of matter rather in a flight of matter !? However, particles in all states of matter also move, often with high velocity. The only difference is that particles move in the fifth state of matter in only one direction, in thermal states, however, in all 3 dimensions. 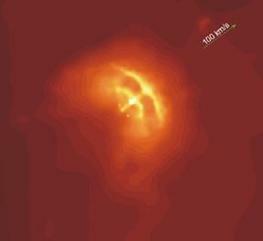 Jets at black holes and young stars are transformed to lobes i.e. positively charged and hot - therefore quickly expanding – gas when they are braked to zero velocity. The motion is essential in all states of matter, the measured very quick motion in filaments can be produced only electrically. The particles are electrically charged not only in the fifth but also in solid and plasma states of matter. Probably, this is the highest voltage of the Universe (Körtvélyessy 1999). It is easy to calculate that this very concentrated positive charge in quick rotation produces the strongest magnetic field of the Universe in the order of 1010 Tesla. This electric model of the neutron star claims that the magnetic axis is identical to the rotational axis - exactly as Fig. 8-9 show. If an atom or a meteor falls in the direction of the neutron star, it will be attracted by the very strong gravity of the star. But at a distance of e.g. 800 m, this falling neutral matter will be torn to electrons and ions by the huge electrostatic field. The electrons are attracted onto the positive surface (and remain there) and the ions are repulsed in the jets (Fig.8-9) along light-years, accelerating to the highest velocities in the Universe. These ions are the cosmic ray particles! This electric model explains that the heavy ions and not the light electrons are the cosmic ray particles. Less than 0.1% electrons are in the cosmic rays! Electrons would be easier to accelerate thermally or by a shock-wave. However, all known non-electric processes are too weak. 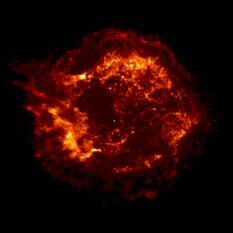 The supernova SN 1987a produced a neutrino-peak but no cosmic ray-peak. Fig. 8 Jets of Vela in rotational axis (Chandra). This picture discards the old light-tower model. Fig. 9 Crab pulsar flies also jetwards (Chandra). As these continually produced cosmic ray particles fly in space, the active (positive) Sun repulses these positive ions; their flux is lower during solar maximum and after every flare (Forbush effect). Recently, NASA speaks about a proton storm during a mass ejection of the Sun. Flying ion- and electron-filaments divert these ions in space and they do not show their origin: the neutron stars. This electric model can also be deduced. The two nuclear forces have only a very short radius. Gravity (one of the two forces of infinite radius) can only attract. Only the positive or negative charge remains as repulsing accelerator! The highest possible concentration of electric charge can only be positive, because only the protons can be fixed on a neutron star. The strong nuclear force of these protons is more than 300 times stronger than their mutual electrostatic repulsion. Electrons (as leptons) could be fixed only with gravity which is 1039 times too weak. The supernova i.e. the highest power-density of the Universe can fix protons onto the neutron star which is the highest concentration of active matter. Therefore, the positive neutron star is the strongest possible accelerator of particles. The acceleration-force of the ions continually pushes back the neutron star. Perhaps a calculation will show a big relativistic mass of these ions and explain the velocities of the pulsars (see arrows of 100 km/s and 150 km/s in Fig. 8-9). The electric repulsion-force does not stop after the ejection! This model explains the huge matter emission of pulsars which would be impossible from their neutron body. 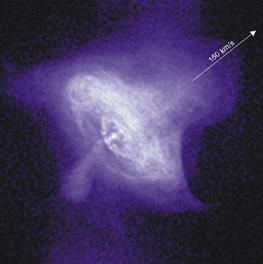 The non-axial jet of the Crab-pulsar (see on the left in Fig.9) is not clear. Fig. 10 The high ranges of the particle energies in the 3rd, 4th and 5th states of matter. Thermal bodies exist up to 105 eV, non-thermal bodies up to 1021 eV, theoretically up to 1026 eV. These cosmic rays are continually accelerated in the jets of the neutron stars (Fig.8 and 9). 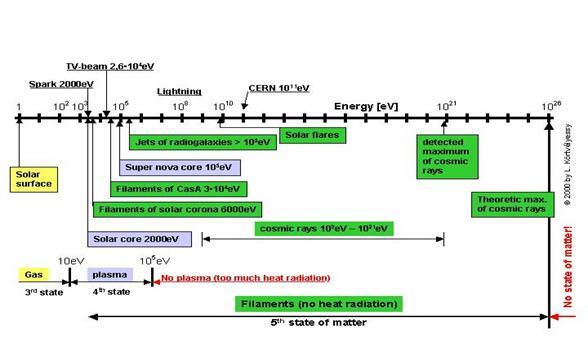 This electric model explains also the measured upper limit of the cosmic rays at 1021 eV. (Perhaps 1022 eV will be found, too.). The theoretic limit is 1026 eV (equ.4) because the „electric neutron star above can only contain a higher positive charge if it has a larger diameter due to its mono-proton layer (equ.4). But the neutron star cannot have a larger diameter without limit because it collapses into a black hole already at about three sun masses. Therefore, a cosmic ray particle of an energy of e.g. 1030 eV cannot exist according to this model (Fig.10). The fifth state of matter is the most energetic one because another state of matter between e.g. 1026 eV and 1035 eV is not possible. One of the states of matter is the Bose-Einstein condensate. It has zero thermal-energy. We should give the number zero to it (table below). Its popular name of the fifth state of matter is clearly incorrect since heated plasma will never be transformed to this Bose-Einstein condensate. Table 3 shows all possible six states of matter. Particles in the Bose-Einstein condensate have almost zero energy and no heat-energy. In this table, the energy of the particles increases from left to right by 36 orders. This energy determines the state of matter in relation to the mutual electrostatic attraction and to the character of the motion of the particles. Physics knows four forces. However, astronomy of the 20th century did not accept the role of the electric force of infinite radius. The cause of this aversion was the tradition, a threatening complication, it was not debated. The present introduction of this force does not complicate but greatly simplifies astrophysics and astronomy. Now, all the four forces of Nature are considered and, therefore, hundreds of very old contradictions are solved. After millennia of three states of matter, after a century of four states of matter, the last years enriched us with additional two states of matter. Very probably, no more than six states of matter are possible. In the last two states of matter, no thermal energy exists. In the Bose-Einstein condensate no thermal but only a very-very low quantum mechanical energy of about 10 -10 eV exists, in the fifth state of matter a very high velocity in only one direction exists and a very high electric energy in form of ions or electrons. The fifth state of matter could be named, therefore, filament-state- or beam state- or electric-state-of matter due to its form or energy or cause of its particle-acceleration. The e.g. Fe9+-ions are not indicators of a temperature of 1MK (Fig.3). They show no high and no low temperature, but a positive filament, i.e. positive matter in flight emitted by other positive matter. Very probably, the Sun has a variable luminosity (causing e.g. ice-ages) due to its electric function. It emits negative filaments as the solar wind. It also has an immediate influence within days on our climate due to its electrically emitted positive filaments which push away the cosmic ray ions (which can be seeds of clouds) and appear as red sprites above the terrestrial clouds. If the models of both electrical reactions are confirmed, the presence and future of mankind – even a possible climate-catastrophe - depend on matter in the fifth state. Did we understand the most conspicuous bodies: the biggest ones (the jets of radio galaxies and galaxy-clusters), the nearest ones (filaments of the Sun, auroras, lightning), the most energetic bodies (flares, jets of pulsars) as the first ones? No, they were understood as the last ones. The matter of these and other filaments is no plasma, but charged particles moving parallel to the filament axis. This simple rule is valid for all filaments of diameters in 20 orders! The most important error of astrophysics is now simply and elegantly corrected after 60 years of mysterious magnetic dynamos and magnetic tubes . Nobody has emphasized, but this supposed Magnetic Universe was always thought to be based on a certain Electric Universe in background. However, this Electric Universe clearly acts via filaments. No mysteries anymore, only physics are necessary. 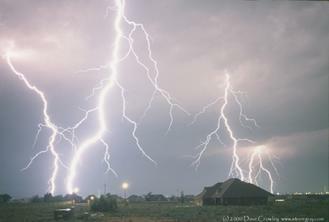 The lightning probably was one of the first bodies which got its own name from the first human beings. But the lightning and other filaments are the last bodies which were recognized as bodies in a correct state of matter – two million years later. All other states of matter were discovered earlier.